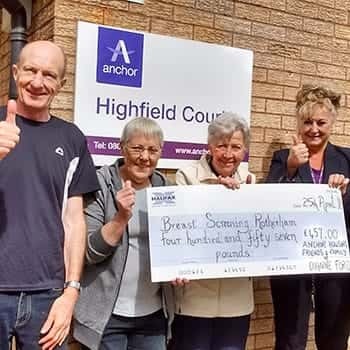 Highfield Court retirement housing scheme in Fitzwilliam Street, Rotherham have raised over £450 for the local breast screening ward at Rotherham Hospital. Scheme Manager Tina Willey, her residents and colleagues held a charity raffle with over 30 prizes in aid of the ward after Tina’s sister, Dianne, was recently diagnosed with breast cancer. Tina said: “We wanted to do a fundraising event for cancer, and Dianne suggested the breast screening ward at Rotherham Hospital as she had found the staff there very supportive. She is hugely thankful to them for their brilliant care and everyone here was very happy to help raise some money for the great work they do. “We had over 30 prizes up for grabs, some donated by people living here at Highfield Court, others by local shops and kind family and friends. We raised a massive £457, which myself and my assistant manager Jackie Dekanski presented to the Rotherham Hospital community charity last week.